Happiness Moon researched and developed fully automated complete pulp molding equipment (Pulp Machine/paper pulp Machinery). With low energy consumption and long operational hours as basis. In 2010, we completed our newest pulp molding equipment which has super long unmanned operational hours. It completely out performed current similar equipment sold today. Complete computer production control, No need for a large group of operators. It is capable of automatic operations. It has the advantages of reliable performance, low energy consumption, easy to operate and maintain. The pulp flow from the pulp making equipment at the front-end to the production system is monitored by the PLC computer. Pulp making and blending is performed by computers to reducing operator error. In the production planning and design, stainless steel piping is used and designed to the standard of food manufacturing. 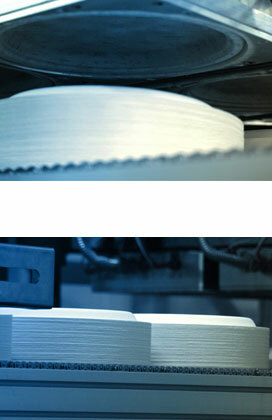 The rapid production process reduces wasted time at every key juncture, greatly decrease production duration. Achieving super high sustainable operational speed and stability. Currently leading the industry by 70%. Unique water jet trimmer and finisher eliminate needs to use a trimming equipment to trim the edges once the product is finished. Product edges are smooth with no scraps. The design educes cost of trimming equipment and manual trimming and at the same time eliminate the problem of trim scraps. Complete cleaning planed. The stainless steel mesh in the mold is automatically washed during production. Each complete product has a stable weight count. No light exposure problem. Product is automatically ejected when it is dried, It has computerized automatic stacking and automatic product count. No more need for manual calculation and sorting. Mold can be changed in 2-3 minutes. This greatly reduces mold change time. It does not need special tool for mold change. Mold change is also not dangerous. From Pulp machinery design, product production, to sales, marketing, service, and management, Happiness Moon Company has a pulse in the complete process. We have high degree of confidence in mechanical equipment design. 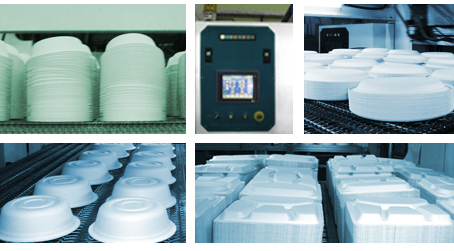 Besides producing mechanical equipment, we have also entered the pulp molded product production. We put our faith and confidence in our production line. We differ in our thinking from the average pulp molding machines manufacturer. We don't manufacture equipments but shy away from production.